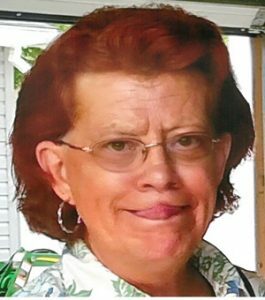 Deborah Marie Shinabery, 60, of Ossian, passed away on Monday, Aug. 20, 2018. She was born to the late Fred and Mary (Wachel) Lers on Wednesday, Nov. 6, 1957, in Elkhorn, Wis.
Deborah was a graduate of Elkhorn High. She worked as a homemaker, caring for family, and had various jobs throughout the years. Deborah had many craft skills such as cross stitching and making realistic doll houses. She enjoyed many things from baking to fishing, but most of all, spending time with her grandchildren. Deborah is survived by her daughters, Samantha (Steven White) Steinhausen and Cassandra (Beau) James; grandchildren, Elic Smith, Layla Johnson, Madison Steinhausen, Gabriel Steinhausen, Seth James, and Hannah James; brothers, Fred Lers, Robert Lers, and Joe Lers. She was also preceded in passing by her husband, Samuel Shinabery; and brother, Greg Lers.